World Cup, Model 8-80, automatic, 8-pocket, intermittent motion, stainless steel, rotary cup filler and overlidder rated up to 40 indexes per minute with number of cups – depending on materials and application. Fill range: up to 80 oz. Container size up to: 6.5" Diameter (with proper change parts). 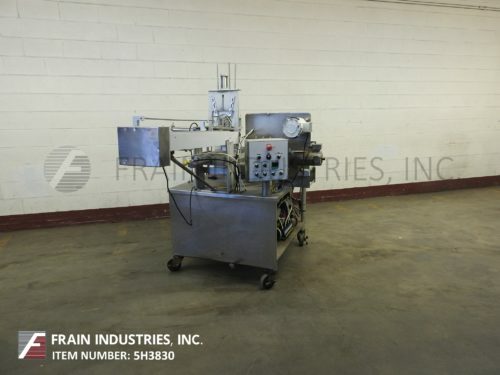 Equipped with 30" OD rotary turn table has (8) 4-1/4 OD cup stations, 24" long empty cup magazine and denester, (choice of liquid or dry type fill station per application). 36" long, automatic, dual roller lid magazine and denster with pnuematic lid closer and sweep arm reject. Control panel has fill, table, lidder and jog / on / off switches with e-stop. Mounted on stainless steel base frame with casters.